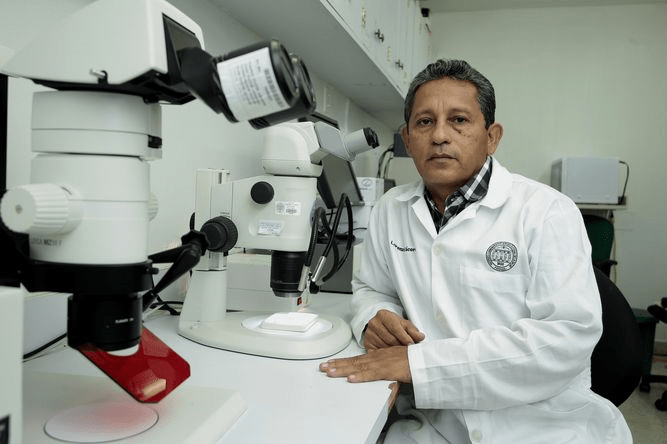 Lorenzo Cáceres, an entomologist who is prominent among the region’s vector control specialists, will have to dedicate himself to another project. He has headed the Gorgas Institute’s genetically modified mosquito program, which was eliminated from the budget by the legislature’s budget committee. Photo by the Instituto Conmemorativo Gorgas de Estudios de la Salud (ICGES). Notwithstanding a public relations campaign by a private British company and various Panamanian public agencies and officials, Panama is about to discontinue an experimental program to control populations of the disease-carrying Aedes egypti mosquitoes by releasing genetically modified (GM) insects into the environment. These gene-spliced mosquitoes would mate with wild ones, passing on a genetic trait that would kill the offspring unless they are fed the antibiotic tetracycline. Aedes egypti carry dengue fever, a serious public health concern throughout much of the tropics and subtropics, and also the emerging disease chikungunya. Aedes egypti also carries yellow fever, which has not been a problem in Panama in recent decades. Back in the days of the US canal construction process, the yellow fever threat and the malaria that’s spread by the Anopheles mosquito were brought under control by stern sanitary measures to drain and apply oil to the swamps where the Anopheles thrive and to eliminate the small, clear bodies of water — such as rainwater collecting in trash or discarded beverage containers, or used tires — in which Aedes egypti thrive. Fumigating with insecticides was also part of the program, but a combination of adverse environmental side-effects, insects’ acquired resistance to the chemicals used and health concerns has reduced the spraying options. A major technical problem unaddressed by advocates of the GM mosquitoes is that there is a second dengue vector in Panama, the Asian Tiger Mosquito (Aedes alobopictus) that might just take over the niches vacated by Aedes egypti. There are also uncertainties about just how fast Aedes egypti mosquitoes from nearby areas could recolonize places where the wild populations were wiped out by GM mosquitoes. The project here was a collaboration between the private Oxford University spinoff company Oxitec and Panama’s public Gorgas Institute. It came during the Martinelli administration and had its advocates within the Ministry of Health and at the University of Panama. Allegations from such quarters that old vector control methods don’t work — that is, taking the failures of successive administrations that have treated public sanitation as a source of political patronage jobs and rigged contracts rather than a critical public service as a given — did raise a few eyebrows on campus. So did the role of the Gorgas Institute, which got contracts with Oxitec for experimental releases in parts of Panama Oeste, as both public science policy researcher and analyst and as advocate of a corporate interest. Were everything to go Oxitec’s way, Panama would hire them for many millions of dollars over a number of years to run Aedes egypti control programs nationwide. As it turned out, the Gorgas Institute asked the Ministry of Health — under new leadership since the 2014 elections — for $6 million to expand the experimental GM mosquito release program. But although there is hesitance to admit it, Panama faces some serious budget problems after the Martinelli years. Plus a French company, Sanofi Pasteur, is getting promising results in large-scale trials of a dengue vaccine. Of the $22.8 million budget for the 2016 fiscal year that the Gorgas Institute requested, the Ministry of Health submitted a $13.9 million appropriation to the legislature, not including money for GM insects. It does not appear that there is much sentiment in the National Assembly, either as a whole or in its Budget Committee, or among the public at large to rescue Oxitec from the budget ax.